1916 Aug 21. MGC Temp. 2nd Lt. A. M. Arnold, M.C,from E. Surr. R. (Serv. Bns. ), to be temp. 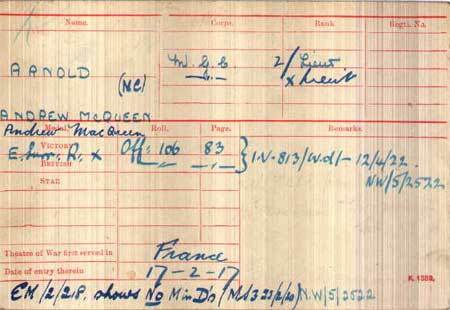 2nd Lt. 21 Aug. 1916, with seniority 5 Aug. 1916. 1918 Mar 19. Gazetted MC. T./Lt. Andrew Macqueen Arnold, E. Surr. R., attd. M.G. Corps. For conspicuous gallantry and devotion to duty. On many occasions, whilst in action, for a period of five days, he displayed great initiative and courage. On one occasion he went out alone into No Man's Land and took two of the enemy prisoners, with whom he returned to our lines. Afterwards he led out a party of five men to a machine-gun emplacement and brought back another three prisoners. Later, when taking his section, forward in a counter-attack, he showed great skill and fine leadership in getting his guns into action. His whole behaviour throughout was such as to inspire the greatest confidence and enthusiasm amongst the men under him. 1920 Mar 20. MGC. Temp. 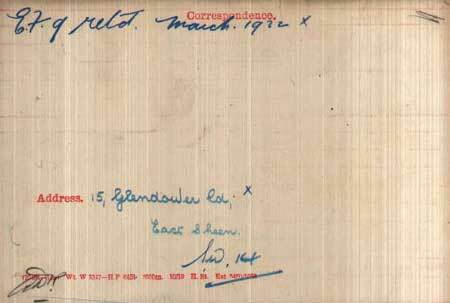 Lt. A. M. Arnold, M.C., relinquishes his commission on completion of service, and retains the rank of Lt.
1923 Apr/Jun Died Richmond, Surrey.